The Knitting Pirate » In Which the Pirate Has Completed Mom's Socks. « In Which the Pirate is Pleased to Present. In Which the Pirate Has Completed Mom's Socks. Angie's baby shower was last weekend, so I finally got to give her the pointy hat and booties. She and her husband absolutely loved them, and I am looking forward to seeing pictures of the baby wearing them in just a few more months. 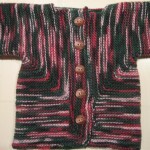 This Baby Surprise Jacket that I knit three years ago was passed along for the new baby, too. 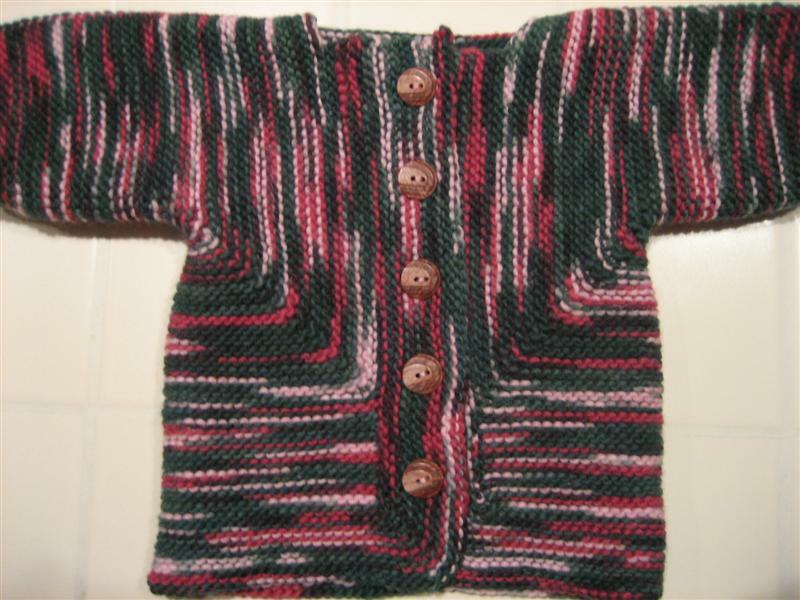 It's wonderful to see handknits being treasured, kept, and worn again by the next baby to come along - it makes me feel so good to know that my work is valued by the people I knit for. Well, the babies don't realize it, but their parents do, and that's what matters, right? Maybe in a quarter-century or so, my friends' babies will be dressing their own babies in that very sweater, and so on down the line. It's a happy thought indeed. 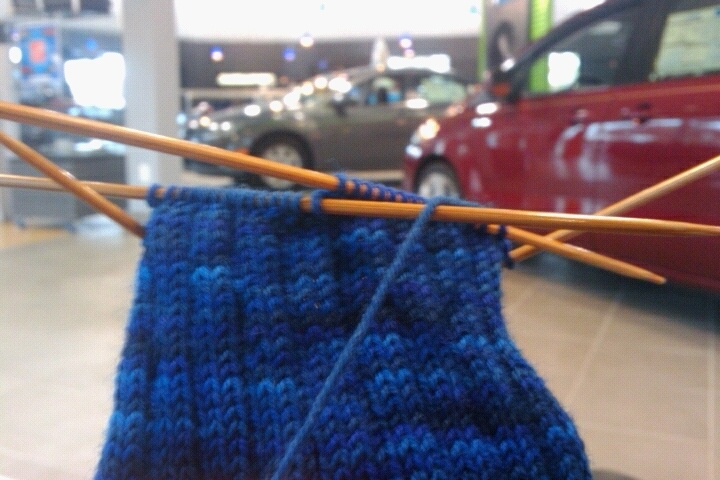 On Tuesday I had to bring my car in for an oil change, and I made sure that I had Mom's sock-in-progress with me. I don't go to any of those "quick lube job" places where they have you in and out in ten minutes, but rather to the Mazda dealership... so I knew I'd be waiting there for an hour. They do have a very comfortable waiting area, with comfy chairs, a big television, free tea and coffee, not to mention a PlayStation with Gran Turismo and steering wheels for two players. But instead of playing video games, I knit (and took this blurry picture with the phone's camera). I was able to finish the foot section while I waited, and decided to save knitting the toe for when I got home. When I got home, though, I didn't knit the sock toe. Instead, I wrote up the pattern for the socks and got it ready for publication. It's simple, and it's much like the Sibling Socks, but I think there's enough difference to make it worth releasing as a separate pattern. It's exciting to have three patterns out now. I'm starting to feel like a Real Designer! A couple of people have asked me if there's a toe-up version of the Cakewalk Socks available. Unfortunately, there isn't - I find that socks with flap heels and gussets fit my foot best, and that's what Mom requested for her socks as well. I know that there are patterns for toe-up socks with gussets and flap heels, but since I haven't knit one yet, I don't feel confident designing one. It's on my list of things to do, that's for sure! I like toe-up socks when I want to use every last yard of yarn, or if I don't know how far my yarn will go. Here's a "montage of some of today's most-visited pattern pages" (which is actually from yesterday, now) on Ravelry. My Cakewalks are right up there near the top! How awesome is that? This entry was posted on Thursday, October 28th, 2010 at 09:45 and is filed under babyclothes, booties, BSJ1, cakewalk, gifts, gnomehat, Mom's Socks, sock. You can follow any responses to this entry through the RSS 2.0 feed. Both comments and pings are currently closed. Looking forward to wearing my first pair of hand knit, made just for me, socks! !